Kim Mi-sung feeds her baby son at their home in Seoul, South Korea, Dec. 19, 2018. The country's fertility rate fell to 0.95 in 2018. The South Korean government continues to struggle to reverse the trend of declining birth rates in Asia’s fourth-largest economy, where the fertility rate is one of the world’s lowest. The country’s total fertility rate, the number of children a woman is projected to have within a lifetime, fell to 0.95 in 2018’s third quarter. It was the first time the rate dropped below 1 and is far short of the 2.1 needed to maintain stability, according to demographers. Seoul Women’s University professor Dr. Jung Jae-hoon labels the current situation extreme. “Comparing South Korea’s birth rate with other OECD (Organization for Economic Co-operation and Development) countries, South Korea is the only country showing an FTR (total fertility rate) below 1.30,” Jung said. It’s a rate that remains the lowest on record for the nation since 2001. 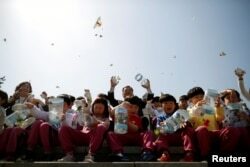 FILE - Children release butterflies during an event to wish for a successful inter-Korean summit, near the demilitarized zone separating the two Koreas in Paju, South Korea, April 25, 2018. Cho Sung-ho, associate research fellow at the Korea Institute for Health and Social Affairs, links South Korea’s downward trend to two factors: an increased number of South Koreans choosing to remain single, and the decline in the number of births by married couples. “The increasing number of single individuals contributes more than 80 percent of the factors,” Cho said. He states that from 1990 to 2010, the number of marriages in South Korea also decreased. The current situation may have arisen for several reasons, including the high cost of raising a child, limited daycare options, and long hours at work. A number of “no kid zones” have also popped up across the country. Jung said that contributes to the creation of a discriminatory culture toward families with children and something that must be addressed. “It is not about overcoming low birth rates, but the overcoming of the social systems which triggered the low birth rates,” Jung said. 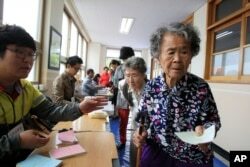 FILE - Elderly women wait to cast their ballots in local elections at a polling station in Nonsan, South Korea, June 4, 2014. In South Korea, 100 working-age people fund the social benefits for 37 citizens. The ongoing trend of declining births in South Korea is affecting the nation. Schools are closing because there are not enough students to fill them and businesses that cater to children “will need to be reformed or collapse,” Jung said. Currently, 100 working-age individuals provide the funds for 37 citizens receiving social benefits, Jung said. However, projections indicate that could jump to a 100:100 ratio by 2060, if not sooner. The South Korean government has spent about $121 billion in the past 13 years to increase the nation’s birth rate, but they’ve largely been unsuccessful. Cho sees a high probability that the trend could continue. “The Korean government started to plan against the low birth rate in 2005 with Basic Plans on Low Birth Rates in Aging Society,” Cho said. He said the plan is in a third stage and focuses primarily on supplementing child care services. South Korea recently announced monthly subsidies of up to $270. This offer has been extended to the country’s richest 10 percent as well, who have been excluded from previous subsidies. In September, Seoul also began a subsidy system giving about $88 a month for parents of children younger than 5. The South Korea Welfare Ministry estimates that 94.3 percent of all South Korean children up to 5 years of age will benefit from the program. The ministry said it will also increase the number of day care centers across the country, with the goal of being able to serve 40 percent of South Korean children. Another effort starting in late 2019 will allow parents with children younger than 8 to spend one less hour at work each day to take care of their kids. FILE - Children play in a fountain to cool down on a hot summer day in front of the General Lee Soon-shin statue in Gwanghwamun, Seoul July 28, 2014. Finally, paid paternity leave will cover 10 days instead of three. Roughly 13 percent of South Korean men take advantage of the benefit. Those opting out may fear taking the time off places their careers in jeopardy or indicate they aren’t dedicated to their employers. Another plan the government has put in place, Cho said, revolves around career training of single individuals. Jung sees that effort as a way for the government to ensure a strong social welfare system in the future. Lee Ju-Hyun contributed to this article.